If you have never tried standup paddle boarding, then The Adventure Islands can give you the chance to enjoy this new exhilarating sport with guidance from our experts. Standup paddle boarding has recently gotten a lot of attention as a sport growing in popularity because it offers a fun way to enjoy the water and get some exercise. Boarding with a paddle might feel a little strange at first, but our staff has taken your comfort and safety in mind to make sure that you have a pleasurable experience. 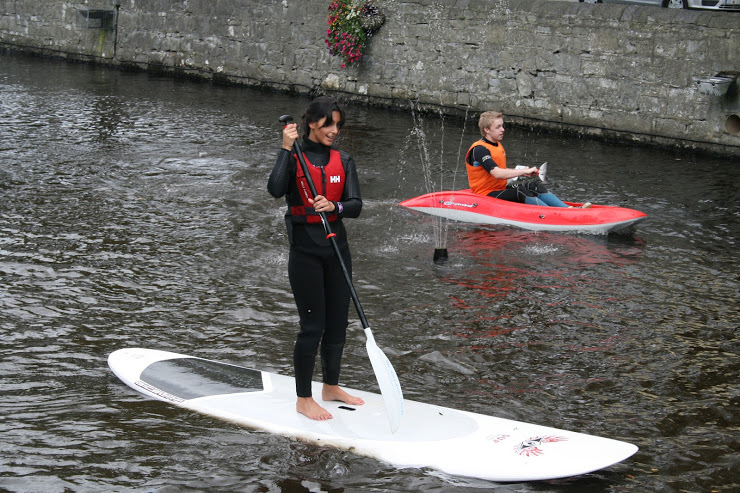 The Adventure Islands offers paddle boarding at various Clew Bay locations, Collanmore Island. Rosmoney and on the lake at our Westport House location. Just because you have never stood on a paddle board does not mean that you won’t take to this sport quickly. Our instructors will show you the most effective boarding techniques to help you maintain control. You’re almost certain to take a few spills into the water, but that is just part of the fun. Get a group of friends together and enjoy this exhilarating activity together.